Pratik Parikh, professor in the Department of Biomedical, Industrial and Human Factors Engineering. Reshaping the network of hospital trauma centers in Ohio and Indiana to increase their effectiveness in saving lives and better utilize resources is the goal of research led by Wright State University. Pratik Parikh, professor in the Department of Biomedical, Industrial and Human Factors Engineering in the College of Engineering and Computer Science, is the principal investigator on this collaborative research, which is supported by a three-year, $492,735 National Science Foundation award. Parikh is collaborating on the project with Priti Parikh, associate professor and research director at the Department of Surgery at the Wright State Boonshoft School of Medicine, and Nan Kong, associate professor of biomedical engineering at Purdue University. Trauma injuries are the leading cause of death among Americans younger than 45 and exact an annual economic toll of $671 billion. Research suggests that trauma patients taken to a Level 1 or Level 2 trauma center have a 25 percent higher survival rate than if they were taken to hospitals without trauma centers. The collaboration includes the State of Ohio EMS, which began with an award in 2014 to study the state’s trauma care and system; Priti Parikh was the principal investigator and Pratik Parikh was the engineering co-investigator. Over several projects during the past four years, the Wright State researchers identified that system-level factors, besides a patient’s clinical condition, affected trauma triage decisions and eventually their safety. Pratik Parikh went a step further and proposed an optimization-based approach to determine the number and location of trauma centers that would maximize patient safety and minimize system-wide trauma cost. Realizing that it was not just Ohio’s problem, but was experienced by every state, Parikh reached out to the Indiana Trauma Division, which is also supporting the NSF grant. The trauma care network should ensure that severely injured patients receive prompt and definitive care. But the geographical locations of trauma care facilities can result in under-treatment of severely injured patients and expensive over-treatment of less severely injured patients. If someone is seriously injured in a traffic accident, paramedics arrive, evaluate the condition of the victim and then decide where to transport the victim — a hospital with a trauma center or community hospital. Transport time can vary widely depending on where the accident occurred. Urban areas have nearby trauma centers, but rural areas often do not. Sometimes victims are taken to a hospital without a trauma center, where they can be stabilized, and are then transported to a trauma center. “Although you may save the victim, the delay in definitive care can cause short- or long-term disability, eventually reducing the quality of life,” said Parikh. Wright State researchers have already generated substantial insights into this issue from previous state awards. The latest NSF award — of which Wright State’s share is $243,175 — will bring an engineering perspective to the problem. Although the team will begin its analysis with data from 2008 to 2012 that includes 47,000 de-identified instances in which trauma incidents occurred and where they occurred, data from more recent years will be made available by the State of Ohio in the near future. The research will consider which cases were under-triaged, in which the victims were taken to a hospital that lacked the services to fully treat the injury, and which cases were over-triaged, in which the victims were taken to a trauma center when lesser treatment was appropriate, resulting in unnecessary medical expenses. The mathematical model will generate near-optimal, trauma networks allowing the state or hospitals to select the most appropriate network based on additional considerations. “The algorithms will be embedded in a geographic information system tool. They’ll see a GIS map of the state and location of all hospitals and trauma centers. The user interface will allow them to interact with the algorithms and visualize the outcome of various hospital relocations and upgrades, and analyze how effective different configurations would be in terms of treating trauma victims,” said Parikh. Parikh, an affiliated faculty member of Kno.e.sis, the Ohio Center of Excellence in Knowledge-Enabled Computing at Wright State, will seek additional resources and expertise from the center’s researchers. Parikh said the approach is general enough that it could be adopted by any state. He is hoping that the outcome of the research will bring the state and the hospital systems together and perhaps result in state financial incentives for hospitals to relocate or upgrade to trauma centers in regions with need. 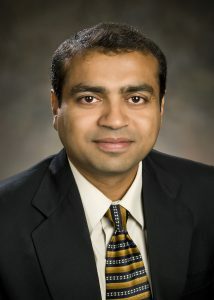 Parikh has set up an advisory board comprised of Mary McCarthy, chair of the Department of Surgery at the Boonshoft School of Medicine; Joseph Sakran, surgeon and researcher at Johns Hopkins University; Andrew Hawk, medical director of Care Flight at Miami Valley Hospital; decision makers at Ohio’s EMS and Indiana’s Trauma Divisions; and several partners at Purdue University. For more information about the research, visit http://cecs.wright.edu/research/daol/.